SRS Travels, known for its dedicated bus service has launched its premium fleet of Mercedes-Benz 15 mtr Super High Deck (SHD) multiaxle coaches on Bengaluru – Belagavi route as a Day / Night Service from 6th march 2017. The service from Belagavi will start from 7th March as stated by SRS Sources. The departure timing from Bengaluru is at 11 am (Anand Rao Circle) and the coach will depart at 10:30 am from Belagavi (SRS Ramdev). Introduction of a direct day service to Belagavi from Bengaluru was most sought for, because of convenience of travelling for lady passengers and senior citizens, who prefer safe travelling as a foremost priority. The convenient departure and arrival timings on both ends will make travelling on the coach preferable. The one way fare of Rs 583/- as of now is economical keeping in view, it’s a premium category air-conditioned coach with semi-sleeper seats. Online booking is available on SRS booking portal – www.srsbooking.com . The day bus service will help people travelling from Belagavi to catch late-night or next day early morning flights from Kempegowda Airport, Bengaluru and also on the same lines it will be easy to catch an early morning train at a convenience. 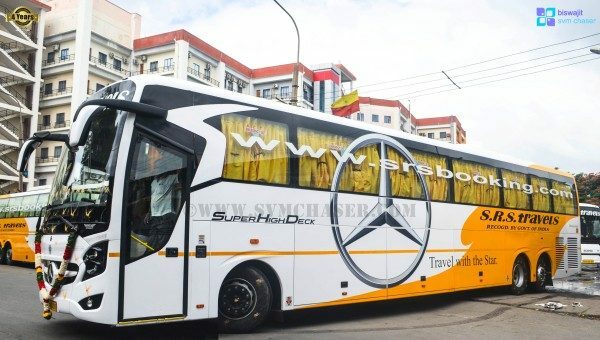 Mercedes-Benz is a reputed brand, and based on our evaluation, we have inducted these coaches in our fleet. We are keen on trying new products in the market, keeping in mind, passenger luxury and comfort. Bengaluru – Belagavi (505 kms) is our second phase of route expansion with Mercedes Benz SHD multiaxle coaches. We have already introduced Bengaluru – Madurai (480 kms) and Bengaluru – Coimbatore (360 kms) routes with the same coaches, in last quarter of 2016. These new coaches come with a new driveline and we wanted to run them on shorter routes to evaluate their performance on road. Being the longest coach in the country, it ensures a higher number of seats and increased legroom. The front fascia of the coach shows Mercedes elegant craftsmanship and exquisitely sculpted body with polyurethane based paint make for an exceptional finish. The spacious 15 cu. m luggage boot and its clear opening height of 0.9 m help take care of the passenger travel needs while on the road. Concluding on a positive note, Mr Chinmay stated, SRS Travels strategy for delivering the best service to its customers. He further pointed out about SRS’s sustainable services as its core USP, leading to a remarkable growth over the years , primarily owing to its policy of commitment, dedication and service. The Author Biswajit Baruah(Belagavi based), is Mentor / Director at www.busbucket.com, a consulting editor at MotorIndia magazine, a bus blogger and has been acknowledged for his work by all the major bus manufacturing companies and Travel companies. Thank you AllAboutBelgaum for publishing my Story.